WASHINGTON (AP) ― Ten years after NASA landed two rovers on Mars for a 90-day mission, one is still exploring, and the project has generated hundreds of thousands of images from the planet’s surface. Now the Smithsonian’s National Air and Space Museum is presenting more than 50 of the best photographs from the two rovers known as Spirit and Opportunity in an art exhibit curated by the scientists who have led the mission. “Spirit and Opportunity: 10 Years Roving Across Mars” opens Thursday and includes many large-scale photographs of craters, hills, dunes, dust clouds, meteorites, rock formations and the Martian sunset. The Smithsonian’s first exhibit of art from the Martian rovers marks the 10th anniversary of the mission. John Grant, a planetary geologist at the museum who is part of the rover mission team, organized the exhibit, in part as a travel log with images on one side from Sprit and images from Opportunity on the other. The rovers landed in January 2004 on opposite sides of Mars and began exploring volcanic deposits and plains, as well as meteorites and impact craters, so the exhibit also focuses on the science, Grant said. ‘’Every one of the images you see here tells a story of discovery that goes along with the story of beauty on Mars,’’ Grant said. It’s a look at an alien planet through the rovers’ eyes, he said. Uncovering signs of the past presence of water and a more habitable environment are among the rovers’ most important discoveries. Some were made by accident. After about 800 days, one of Spirit’s front wheels stalled and stopped functioning. So the engineering team decided to continue driving it in reverse, dragging the broken wheel across the Martian surface. That dragging dug a trench behind the rover that soon uncovered a new material as white as snow. It turned out to be silica material that would normally be found in hot springs and hydrothermal systems ― habitable environments. The rovers also found concretions and layered sedimentary rocks made of sulfate salt that showed water had once been on the planet’s surface. While some panoramic images clearly show the red Martian landscape, other images focus on other colors that can be found in Mars’ rocks, soil and sky. One image of the Martian sunset shows a bluish color in the sky, which is usually pink in the daytime due to the reddish dust in the atmosphere. But it turns blue at sunset ― the opposite of Earth, Squyres said. Jim Green, NASA’s director of planetary science, said the rovers have made huge strides in learning about Mars to eventually send humans there. 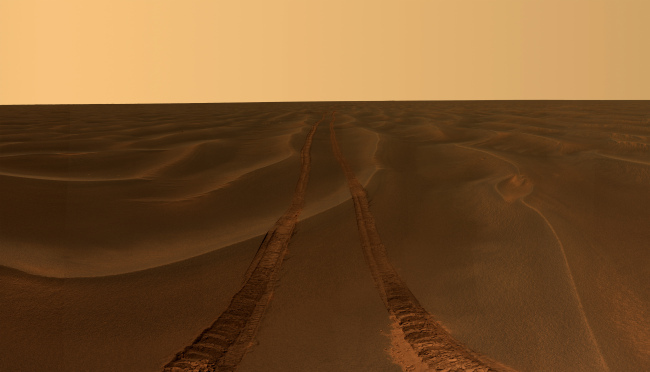 Another rover called Curiosity is also now exploring the surface, and NASA plans to send more rovers before humans.